This has definitely been the summer of mangoes for me. I’ve totally fallen in love with them and have admittedly been slighting other fruits as a result. Usually by the time August rolls around, I’ve been knee-deep in peach recipes, but I’ve completely neglected them this year. So, a few weeks ago, when my Chief Culinary Consultant’s mom invited us over for a cookout, I jumped at the chance to bake a pie using ripe, juicy peaches. 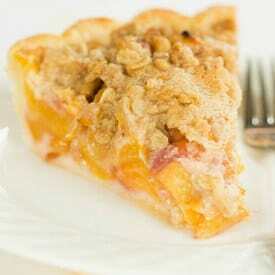 A Dutch apple is the only crumb-topped pie that I had made to date, so I was eager to give it a try using peaches. This definitely falls into the “easy” category as far as pies are concerned. Single crust… no blind baking… no peeling peaches… crumb topping. That’s about as easy as you can get! 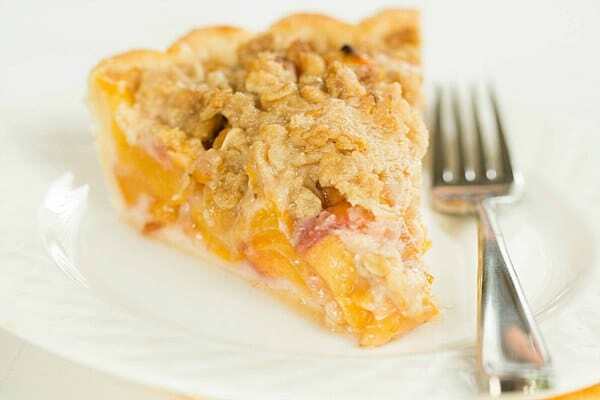 A simple peach pie with an oat-crumb topping. Make the Crust: In a food processor, pulse the flour, sugar and salt together to combine. Add the butter and pulse until the mixture resembles coarse meal, with a few pea-size pieces of butter remaining, about 5 pulses. Sprinkle 3 tablespoons of the ice water over the mixture and pulse until the dough is crumbly but holds together when squeezed, about 5 to 10 pulses. If necessary, add up to 2 tablespoons additional ice water, 1 tablespoon at a time; do no overmix. Form the dough into a disk and wrap tightly in plastic wrap. Refrigerate until firm, at least 1 hour, or overnight. Make the Crumble: In a small bowl, combine the flour, brown sugar and oats; using your hands, work in the butter until large clumps form. Cover the bowl with plastic wrap and refrigerate until ready to use. Preheat oven to 375 degrees F. Lightly flour a work surface and rolling pin and roll dough out into a 12-inch circle. 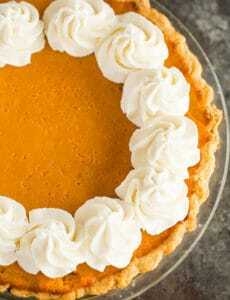 Transfer to a 9-inch pie plate, fold the overhanging dough underneath itself and crimp the edges. Place the dough-lined pie plate in the refrigerator while the filling and crumb topping is prepared. Make the Filling: In a large bowl, toss together the sliced peaches, flour and brown sugar until combined; set aside. 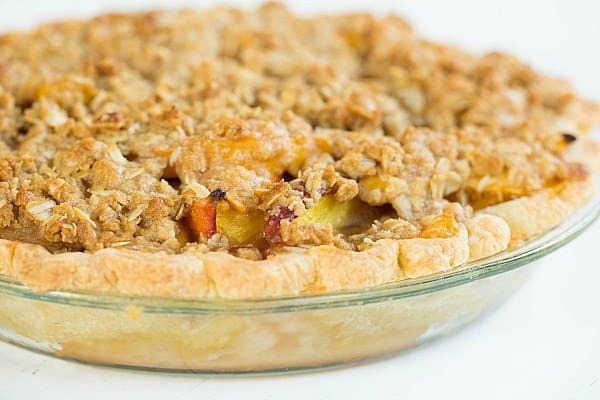 Assemble and Bake the Pie: Transfer the peaches to the pie shell, then break the crumble into medium to large size pieces and sprinkle evenly over the top of the pie. 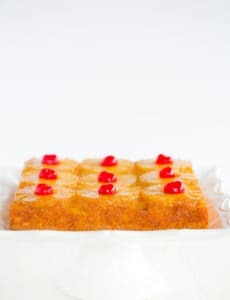 Place the pie on a rimmed baking sheet and bake until the juices are bubbling and the topping is golden, 1 hour to 1 hour 15 minutes. Let cool on a wire rack at least 1½ hours before serving. The pie can be stored, covered at room temperature, for up to 2 days, but it is best eaten the day it is made. How long do you bake this the peach cobbler? Hi Virginia, This is a pie, not cobbler. But, as the recipe states, 1 hour to 1 hour 15 minutes. Enjoy! My mother in law has two peach trees and I’m always looking for peach recipes. 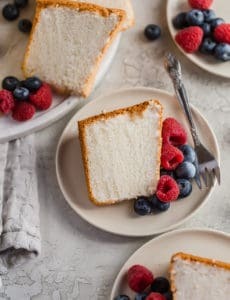 I tried this recipe for Father’s Day and it was perfection! Thanks for the recipe. It’s a keeper. OMG…this recipe rocks! We were apple picking and stumbled across the “very last of the season” peaches…they were amazing! After we ate a few of these wonderful peaches I looked up this peach pie recipe and I have to say it is the best pie we have ever made/tasted. 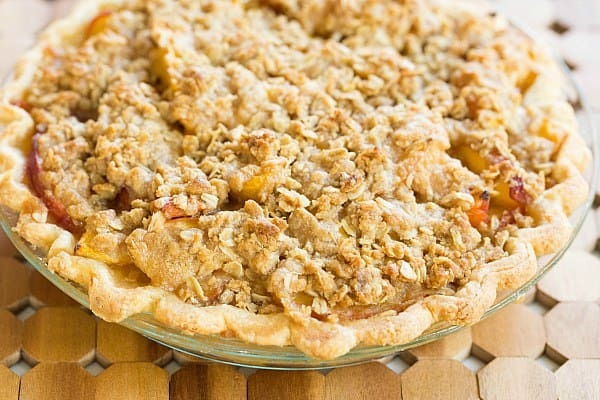 All three factors…the crumble crust, the filling and the actual pie crust work so well together that you find yourself wanting to get a taste of each with every bite! Thank you BEB for this amazing recipe. Although my peaches were sweet and the crumble was wonderful…there was not enough sugar in the peaches. Two tablespoons are just not enough to make a “pie filling” instead of just cooked fruit in crust. I was sorry to use the last of my peaches in this way. I really like how you setup your instructions easy to read & follow. After trying an other recipe that required “blind baking” yikes! that was a long process for this new baking boy. I had to look at your recipe to find that indeed it takes up to an hour for the crumble to bake. The other recipe said 45min. I have to give your recipe a try as I have a lot of x-tra peaches left over from the other recipe. Back to the kitchen…Thank you. I’m glad I found you. Made this recipe for my work’s 4th of July pot luck, and it was a huge hit! 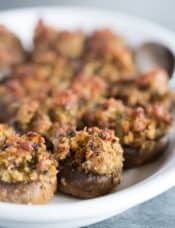 Thank you for this great recipe, the filling, and crumb topping came out heavenly, and not to mention the smell of the house as it was baking. 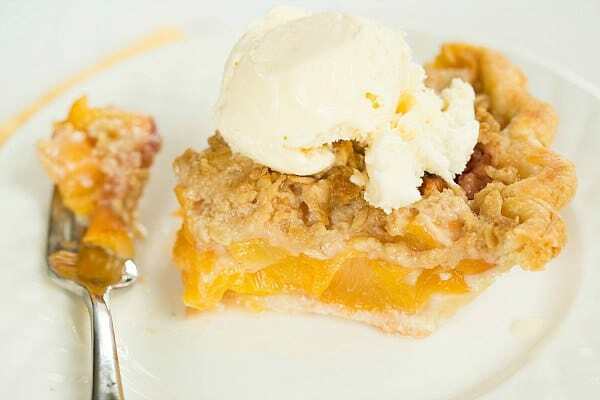 There’s nothing better than a fresh peach pie on the 4th. Happy 4th of July!!!! First, I was drawn to the recipe…then I was drawn to your blog name! I cannot wait to try the recipe and I look forward to receiving your blog updates. thank you from one brown eyed girl to another! This looks soo good! Do you think it’s possible to substitute the peaches with nectarines? They taste the same, but im worried about the consistency..
Hi Andrea, I haven’t tried the substitute in this pie; if you try it, let me know how it goes! Love this classic and easy to make pie! Peaches are my favorite part of summer. It’s my summer tradition to make peach blackberry pie. I’m just waiting for the second local blackberry crop to ripen. There’s nothing more comforting than a slice of homemade pie with a scoop of ice cream! I have been swimming in peaches the past couple of weeks. They are so good. I love this pie. Makes me mad that I made a blueberry crumb pie the other day. Totally should have done peach!